Home / Firmware / FM / MOTOTRBO / R2.5 / UL / New in R2.5: Incorrect battery alert in FM and UL radios. New in R2.5: Incorrect battery alert in FM and UL radios. A few months ago you might have read my post about the change from FM to UL. 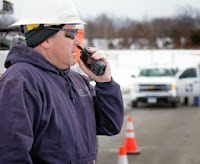 At this point in time, some customers may have a mixed fleet of both FM and UL intrinsically safe radios. There is a risk that an uneducated user may try to fit a FM battery onto a UL radio and vice versa. To solve that problem, a battery mismatch alert setting has been added to the CPS and radio. The incorrect battery alert warns radio users if they accidentally do this. Using the radio with the incorrect voids the intrinsically safe radio certification. In the CPS there is a drop-down which allows you to select either FM or UL. match the codeplug selection, the radio sounds an alert. You can of course, turn this feature off if you don't need it. This does not apply to ATEX radios. It is physically not possible to fit either a FM or UL battery to a ATEX radio.